Walking into the Opening Ceremonies at Commonwealth Games in Manchester in 2002 and hearing the roar of the crowd – this was my first tour playing for Canada. Singing Oh’ Canada at the start of our games. 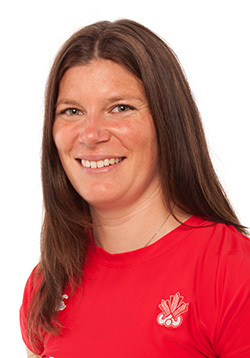 For the past 8 years I have been a member of the Canadian Women’s National Field Hockey team and for the past eight years I have seen my teammates and I work to be more than just the best in Canada. As a player I am responsible for giving quarterly levy’s and fundraising so that our team has the funds to play more international games. Over the years I have had to continuously turn to my friends and family for this support. This year CAN Fund is giving me that support. Thank you CAN Fund. My nickname, “Barney”, came from my first year at University when I dressed up as Barney the purple Dinosaur.